Babor HSR lifting extra firming cream, Etat Libre D'orange Archives 69 &amp; Rein. Like over 9000 different people in the blogasphere that will be posting about this, but I like offering my thoughts on things like this because its something I'm genuinely interested in. I think the social media elements of this whole Beauty/Sample Box phenomenon is really interesting. As I think that plays a big part in the reaction to beauty boxes that are out there. Unlike Glossy Box, I think Boudoir Prive could genuinely survive in a "real" world rather than the blogging one. Us Bloggers are fickle and shallow people who like brand names. Ask anyone what sort of samples they'd like in a beauty box and Im sure most of them would say MAC, NARS, Bobbi Brown, Laura Mercier... You know high end stuff that you would find in most department stores. Brands that most people would buy if they had the money. Boudior Prive is certainally luxury, The samples arent that cheap. Mainly exclusive-high end brands that I think alot of people wouldn't have heard of before. I think the general public would more likely be taken with the things in this box, than bloggers. I think generally the general public might not really care about brand names and just like that little touch of luxury each month. I dont think that Glossy Box and Boudoir Prive will be doing some one-up-man-ship over the next few months as I do think that they are different in their own ways. Boudoir Prive seems a little more thought out, where as Glossy Box seems a bit month to month. Like Glossy seem to have no long term plan in what's going in boxes, which can make it feel a little thrown together. Like last months box had 2 full size products, which seems slightly silly for a box that is labeled as a "sample box"! I think a fair few people who got the Boudoir Prive box were expecting a Glossy 2.0 stylee first box. Something high-end, full size from a well known brand. I can see why people are disappointed but not everything is aimed at our age range and at bloggers. You can use 1BOX12 to get 50% off your first box if you fancied signing up just to see what its like! Think i might look into this one as the glossy box is a bit more expensive and i would like to try out new brands. I totally agree - I think people's opinions are based on their high expectations and there would be just as many people pleased with their Boudoir Prive box as others with their GlossyBox. I agree with you as well. If people stop putting high expectations into these boxes, they'd actually end up enjoying them a lot more! I'm not currently subscribed to Boudoir Prive, only GlossyBox, as I wanted to see a few reviews first. I think I'm definitely interested now and I agree that people shouldn't assume that the two will be similar. I also agree that people expected something like the full size Nars product in the first GlossyBox. Anyway, I hope you enjoy the samples! I wish I had waited a bit now, I ordered my september box earlier and 50% off would have been nice! I subscribed to GlossyBox recently as well and my first box should be in September, should be interesting getting my first box from both at about the same time. I was thinking about doing a review for my Uni paper about the two of them but not so sure yet! I've seen a lot of people complaining about the teabags but considering it only cost £10 I don't think they can really complain that much! Hope you enjoy your box - and your tea! 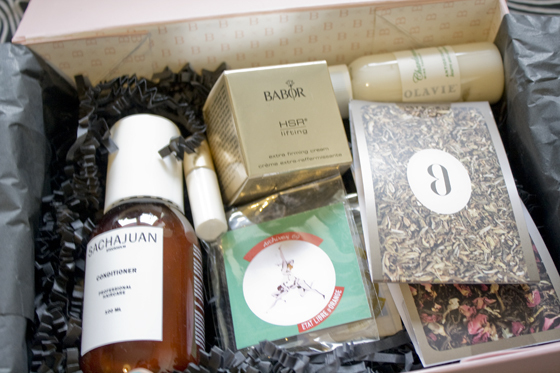 This box is so much more like the American Birchbox, with the fact that you get some pretty 'random' products like tea bags etc, but even that has some well known brands thrown in like Laura Geller, Joues and the like. I think i'm pretty taken with GlossyBox at the moment and want to see a few more boxes from each and even Feel Unique before I make a decision of which brand to stick with. I am obsessed with this little concept and love getting little gifts through the post. This looks more like luxury samples in my opinion. I don't think I know any of the brands but they are a very fair size and they just look like luxury to me for some reason! Maybe it's because I don't know any of the brands that I can't really judge them or compare them against other items in the box? Either way, I find this v interesting - I might wait and see for a month or two and then maybe subscribe. You've written a really good review, hopefully my box will arrive tomorrow! 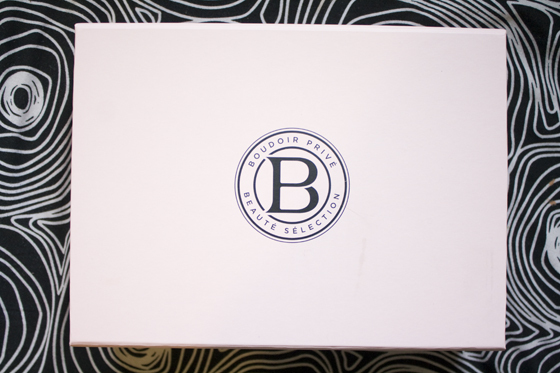 I'm excited to try all the products that arrive, and I think we've got a lot to think about with the difference between the two - I think I'm going to put together a Glossybox vs. Boudoir Prive post so people can choose which one is better suited to different people tastes! I have never even heard of this? Jeez I must be so behind! Just signed up using the 50% off code,, thankyou!! we will see what I get next time,, do you think you can unsubscribe any time like glossy box? Ive just signed up to glossy box, purely because i quite like trying out the new and less known brands, but now im thinking i should of gone for this one!! I think those boxes are a great idea and hey, I'm always glad to learn about brands that I haven't heard of before. And I agree - these boxes are not strictly aimed at bloggers and people at the beginning of their 20s, so a bit of wrinkle cream makes sense. Plus, skincare is important and starting to work against the aging process of skin in your mid-twenties is important! Just because these brands aren't well known names, doesn't mean people shouldn't appreciate them. Brushing them off because they don't have NARS slapped on the front is silly because in fact these items are super expensive which is probably why not many bloggers know of them. The Babor cream, for example, is over £80 for the full size. I guess these types of products are well known only with beauty editors and the people who can afford them. I think an insight into such expensive products for only £10 is amazing!